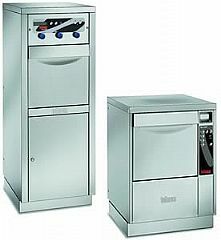 The Revo is a bedpan washer of a new and modern concept, conceived to be innovative, the Revo is an expression of sophisticated and advanced technology. Made entirely of stainless steel AISI 316,with an aesthetically pleasing and harmonious design, a strong structure and a very modern one-piece wash chamber with a highly efficient self-cleaning system. Designed as a multifunctional aid, capable of holding all the receptacles commonly used in hospitals . 100 Series: M - Manual Door, A - Automatic door, H - Floor Standing, E - Economic Floor Standing. The numerous safety features include: door lock for the entire duration of the cycle, machine shutdown in the case of clogged discharge outlet, door opening possible only once disinfection is complete, disinfection check, acoustic alarm to indicate faults,24V controls etc. Excellent results have been achieved by totally eliminating areas where dirt tends to collect and giving rounded corners a wide curvature allowing liquids to drain off efficiently. Careful design backed by numerous testing has allowed our research centre to produce a high performance steam generator that offers excellent energy conservation thanks to a special integral insulation system. The LCD display shows the stage of the cycle, the type of program, the temperature and faults at any given moment. The various programming levels are protected by an access code and can be accessed using the keypad to adapt the machine functions to your specific requirements. A latest generation microchip controls the machine's electronics. The microchip is powerful and reliable and offers numerous advantages such as easy programming. The self diagnosis function offers statistics concerning the functioning and use of the machine as well as a record of historical events. An interface channel for RS232 communication on Modbus file is present. Thanks to this link the historic record of events can be printed. The door opens automatically and is controlled by a foot-operated pedal. Limescale - remover dispenser. - Special racks and holders are available for all the models with the exception of HE/HEA models . - Built-in detergent pump dispenser is a standard for all models with exception of HE/HEA models.